In the depths of winter when we just don’t feel much like cooking, our household eating strategy is quite simple: Cook once. Eat twice! When the inspiration to cook a meal strikes, I’m sure to prepare enough ingredients (cook once), to become the star of another meal, (eat twice). Roasted root veggies from supper become toppings for pizza or fillings for a calzone. Caramelized onions elevate burgers to star status, and are delicious as a base for a savory sauce on a hot meat sandwich. Leftover luncheon chicken stew ladled into individual casseroles and topped with dumplings makes a hearty potpie. Cooked sides like noodles, rice and grains are quickly and easily transformed into stir-fries and salads. For example, the next time you serve spaghetti, cook extra pasta. 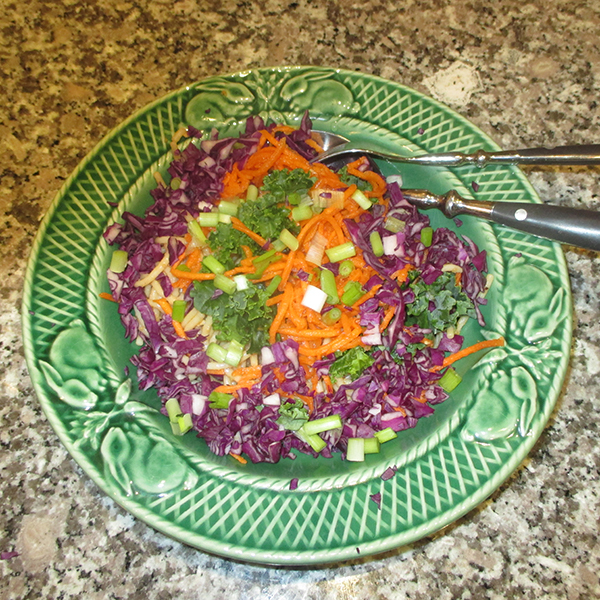 To enjoy a plentiful dose of seasonal vegetables and eat Twice, try this recipe for a Veggie Noodle Salad Bowl. In building this colorful salad, consider the noodles as a blank canvas. Toss the strands of pasta with a little sesame oil, and layer them in the base of a bowl. Or for an easy to-go meal, use a wide-mouthed pint mason jar. Now comes the fun and creative part. Grated orange carrots, slivers of red apple, chopped purple cabbage, roasted butternut squash, chopped kale or spinach, creamy, green avocado, cherry red tomatoes and shaved fennel or celery are versatile, nutritional and delectable toppings. You should have at least 1-cup total of chopped veggies per bowl. The crowning glory on your culinary masterpiece is a dollop of Spicy Peanut Dressing. A riff on a Thai-inspired sauce, this dressing is easily prepared in a 2 -cup clear measure or Mason jar. Spoon the smooth or chunky peanut butter into the jar. Then carefully stir in the rice vinegar, soy sauce, fresh ginger and garlic. 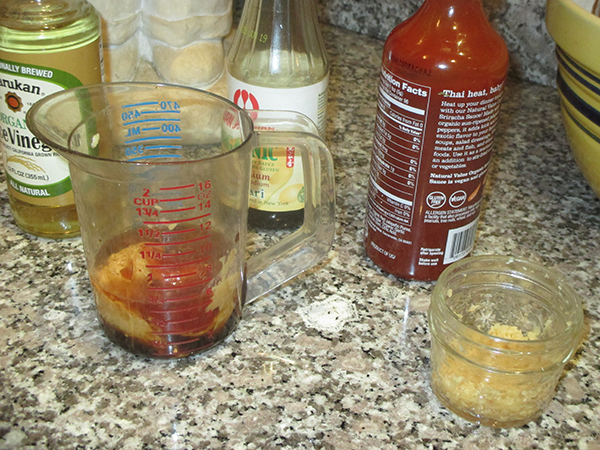 Slowly add small amounts of the Sriracha chili sauce, tasting as you go. Add more ginger, garlic and sauce as needed to taste. Lastly add enough water to the mix to make one cup of dressing. Measure the peanut butter into a 2-cup clear measuring cup. Stir in the rice vinegar and soy sauce. Add the finely grated ginger and chopped garlic. Add the Sriracha chili sauce, stir well, and taste for heat. Add water to the mixture to make one cup dressing. Layer the noodles in the bottom of the salad bowl and toss with the sesame oil. 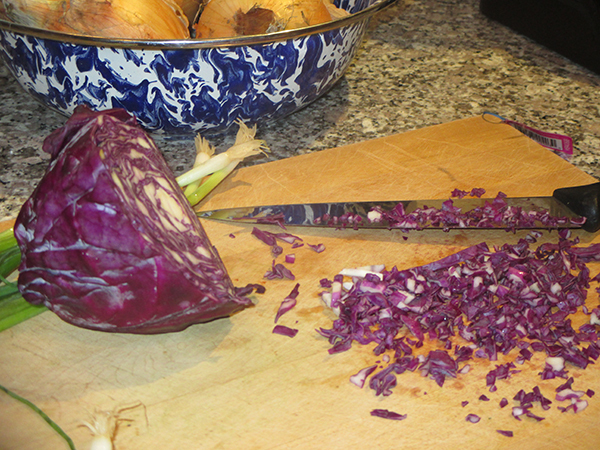 Top the noodles with the grated carrots and arrange the red cabbage and chopped kale around the carrots. Sprinkle with the chopped scallions and top with 1-tablespoon Spicy Peanut Dressing.